Yes, boys and girls it is that time of the year again. The unofficial end of summer begins in central New York with the start of the 12-day run of the 2012 Great New York State Fair. The Fair opens tomorrow and goes through Labor Day. Instead of sharing a bunch of links from years past, I am going to share a pictorial preview from last year’s NYSF. Livestock of all kinds compete for ribbons including this curious goat. 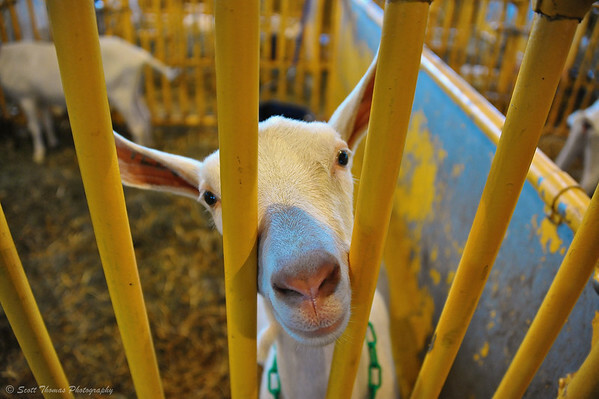 A goat looks through the bars of his cage at The Great New York State Fair in Syracuse, New York. Nikon D700/28-300VR, 1/60s, f/3.5, ISO 2800, EV 0, 28mm focal length. Fair food gets a bum rap. If you look around, you can find non-fried foods like in the International Building. 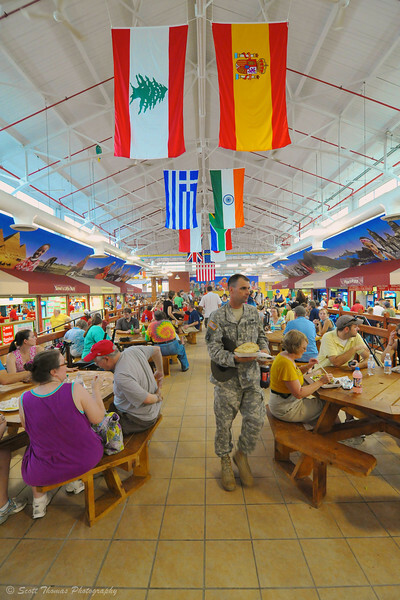 A soldier walking to a table to eat in the International building which features cuisine from all over the world at The Great New York State Fair. Nikon D700/Tokina 11-16mm, 1/60s, f/8, EV -0.3, 16mm focal length. Of course, if you like your Fair food fried and greasy, you will have your choice of vendors frying almost anything. 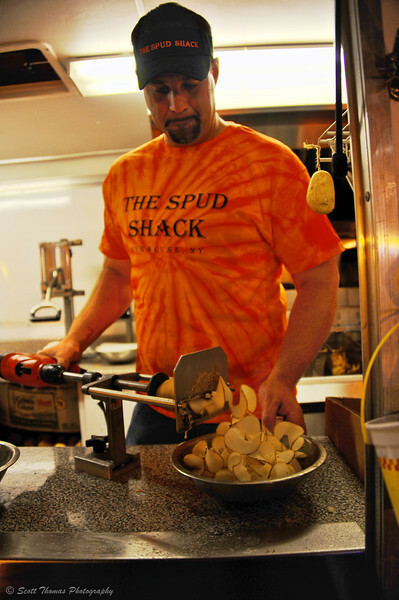 Making ribbon fries at The Great New York State Fair. Nikon D700/28-300VR, 1/60s, f/4, ISO 200, EV -0.6, 28mm focal length. Games and rides of all kinds will challenge people’s skill and stomachs on the Midway. A young boy tries to make a basket at a Midway game during the Great New York State Fair. Nikon D700/28-300VR, 1/60s, f/3.5, ISO 640, EV +0.3, 28mm focal length. Sometimes Mother Nature adds to the colorful atmosphere of the New York State Fair. 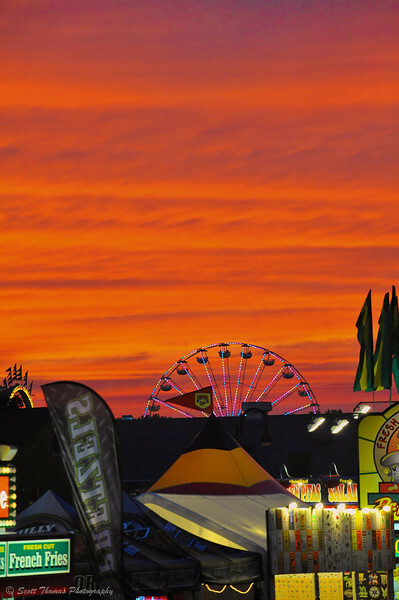 Sunset at the Great New York State Fair in Syracuse, New York. Nikon D700/70-200VR, 1/200s, f/8, ISO 5600, EV 0, 200mm focal length. Now, if you would like to see more posts about the New York State Fair, CLICK HERE. 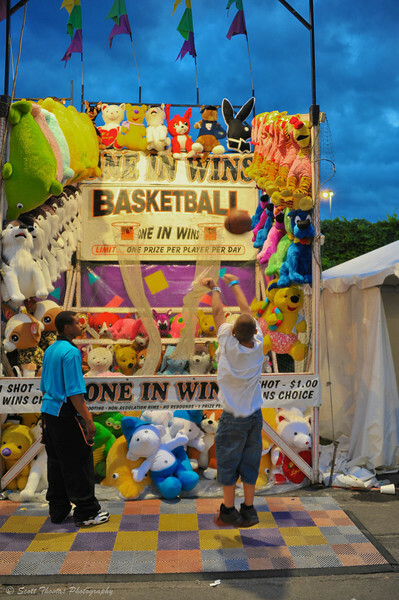 This entry was posted in Event, Travel and tagged 28-300mm, basketball, food, fried, fries, game, goat, midway, new york, New York State Fair, nikon D700, nysf, potato, sunset, syracuse, tokina 11-16mm, vr. Bookmark the permalink. Ah, yes, I can almost smell the mix of hay and sawdust, the scent of various animals and birds, and fried oil and popcorn! The sounds of music from the stages, the rush of hooves in the horse show and the screams from the midway! There is nothing like a state fair and as much as I like them, I am willing to wait out the rest of summer before ours arrives in mid-September. That last image is quite something….what a sky! Enjoy the Big “E”, Tracy! Many of the vendors and the whole Midway from the NY State Fair will be there to greet you. Those skies are rare and I was fortunate to catch it. I had on a 70-200VR lens for the barrel racing. Worked out as the compression of the fair stands at the bottom look neat. Thanks, Scott! These kind of sunsets only show up late in August for some reason. Must have something to do with Sun angle…anyway, it made for one heck of a show. Time for the fair! You’ve **almost** got me in the mood. The Houghton County Fair is this weekend. I agree with Barbara. That goat made me smile, and the red sunset with the fair in the foreground is really stunning.